I don’t do normal particularly well – especially when it comes to recipes. I always have to go slightly left of centre, or right, whatever, but rarely straight down the middle. I make pies with beetroot or purple carrots, I make ice cream with avocados, I make sandwiches with fruit. So when we chose ‘Nuts’ as the Sweet Adventures Blog Hop theme for July my mind started ticking away. Baklava did occur to me, as it had for our ‘Layers‘ theme in March, but the same thing that put me off of it then – namely the enormous amount of honey that gets poured over the top – put me off this month as well. Now I recon we’ll get plenty of macaron entries, perhaps a dacquoise or two, maybe a frangipane tart and most definitely some decadent peanut butter deliciousness. But again, almost all of those desserts require copious amounts of sugar and butter, and after a couple months of way too many indulgences my pants are decidedly tighter than this time last year – another option had to be found. I love a good Orange & Almond cake, but that’s been done round these parts, and ever since I made the Vegan Chai Buttercream with hazelnuts I had been wanting to try my hand at a version of cashew cream. This amazing [if I do say so myself] ‘cheesecake’ was the result. An expected touch of caramel from using dates instead of sugar to sweeten the cake. A crunchy crumbly crust with quinoa flour and cocoa powder. Coconut oil to hold it all together and a smidgen of chocolate to top it off. Not a hint of tofu in sight and as an added bonus I discovered a great blog while researching recipes – yum! RJ, while asking me what was in the cake and giving me a suspicious sideways glance, polished off a whole slice in about a minute flat. I’m trying to resist another piece due to a rapidly approaching Sunday evening yoga class. I have a feeling this cake will not last very long in our fridge. Whenever I make these crazy dairy free/soy free/sugar free creations and they turn out well I always think about my sister-in-law. My brother is pretty much everything-free these days and as a result, L and Ms G are subjected to his pantry and refrigerator options. 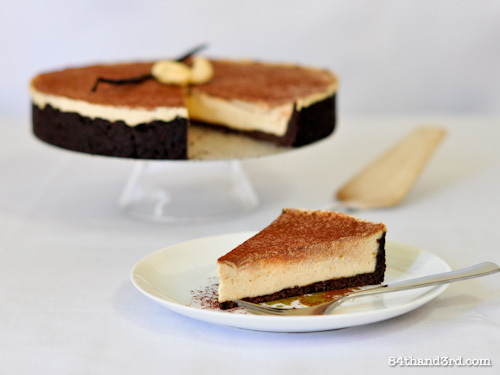 Last week was L’s big 3-0, and so this Vegan Vanilla & Chocolate Cashew Cheesecake is for her. Hey L – maybe I’ll make another one when we come to visit! If you haven’t already, don’t forget to enter my Baker’s Secret giveaway over here. Open until Thursday, there are some great pans and accessories to be won! Prepare pie crust in an 8″ [20 cm] tin with the sides lined with baking [parchment] paper. Drain and rinse cashews. Puree all ingredients except cocoa until smooth. Scoop out 1/3 c filling to mix through cocoa and extra water. 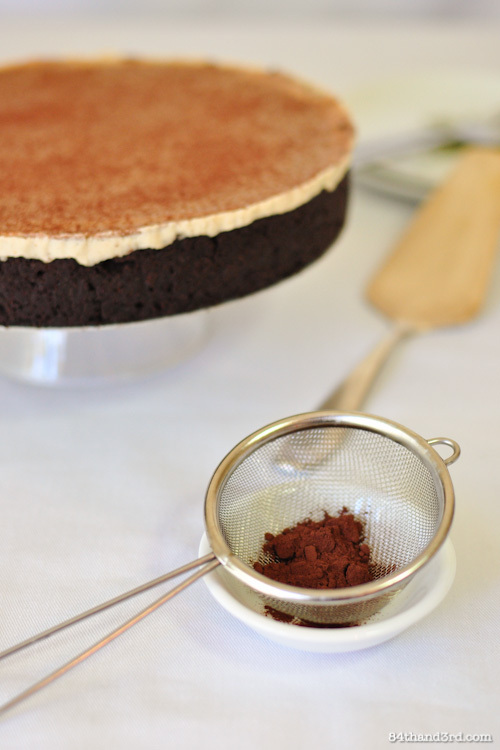 Spread vanilla filling into prepared crust, dollop chocolate filling over top and spread evenly with an off-set knife. 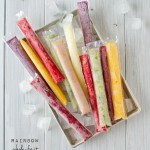 Freeze for 1 hour or refrigerate for 2 hours to chill through and set. Dust with cocoa powder, cut and serve. Store in refrigerator. Rinse cashews and cover with filtered water, soak 6-8 hours – I leave mine overnight. Prepare crust in an 8″ [20 cm] tin with a removable base. Springform works well for this but you can also use a pie plate. Line sides of pan with baking [parchment paper]. 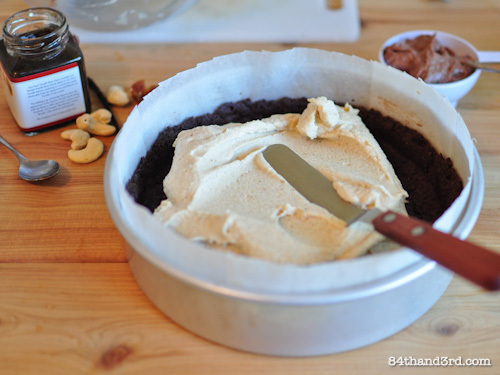 If making Quinoa Chocolate Pie Crust, bake and let cool while you prepare the filling. Remove pits from dates and chop roughly. Drain and rinse soaked cashews until water runs clear, they will be very soft. 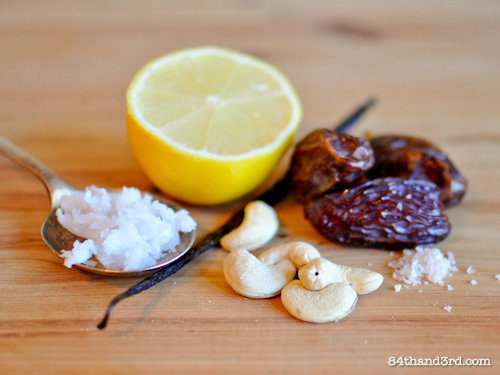 Blend half the soaked cashews with the lemon juice, coconut oil and dates until very smooth. Add remaining soaked cashews, vanilla, salt and almond milk or water and blend again until very, very smooth*. Scoop out 1/3 c of the filling to stir through the cocoa powder and extra water*. Spoon vanilla filling into the prepared pie crust and smooth top with an off-set spatula. Dollop bits of the chocolate filling over top, swirl with the tip of the spatula then smooth. 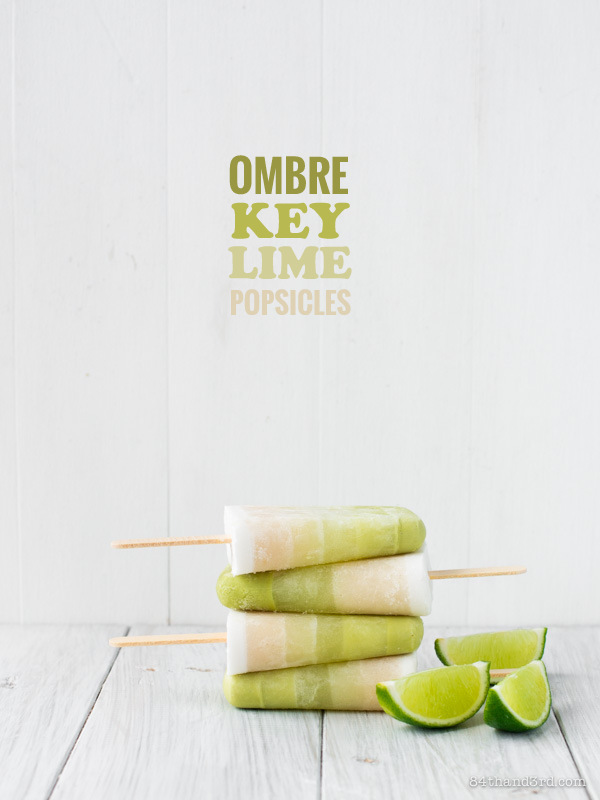 Freeze for 1 hour or refrigerate for 2 hours to chill through and set. Remove sides of pan, peel baking paper off sides. Dust with cocoa powder. Run a sharp knife under warm water to cut. Serves 8-12 if you can be bothered sharing. I started with an immersion blender but swapped to a small food processor half way through and blended the filling in two batches. If you have a food processor go for that first. If you have a vita-mix I am very jealous. If you just want vanilla don’t bother with the chocolate bit on top, it does add another fun layer though. This post is part of the July Sweet Adventures Blog Hop – Nuts about Sweets – hosted by Nic from Dining with a Stud. SABH is a monthly blog hop brought to you by your hostesses – The Hungry Australian, Dining With a Stud, The Capers of the Kitchen Crusader, Delicieux and me – 84th & 3rd. Make sure to check out all the other wonderful Nutty creations that have been linked-up below! 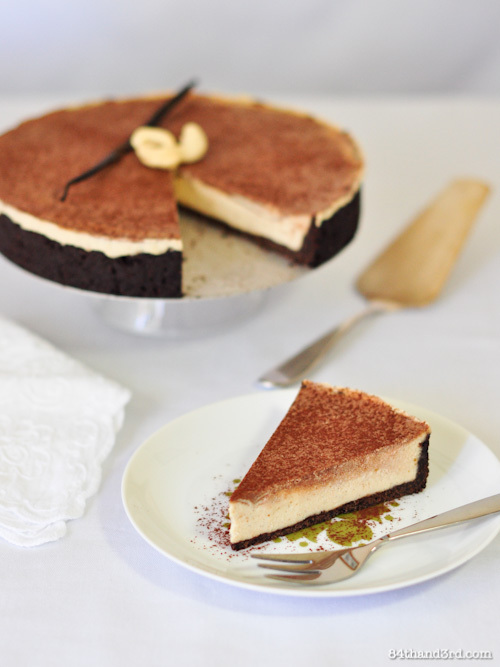 Oh I love a good cashew cream ‘cheese cake’ I made one a while back that was also a huge hit – I distinctly recall my Dad saying to my mum “why don’t you make stuff like this”… Cheeky grin on my part for the fact he loved such a healthy version of a typical cheesecake – daggers from mum for making her look bad! Mind you, my cake looked nowhere near this amazing! Haha! RJ is choosing to ignore the health factor and inhale as much of this cake as possible 😉 Thanks! As always an amazing creation JJ! I love that this is dairy free. I am going to give it a go this week (after you post your base recipe). I adore cheesecake it is my favorite dessert. I am not sure it will end up looking as gorgeous as your does but will give it a whirl. Thanks for the great recipe. Metric conversions for the measurements please. I have not idea what ‘c’ is. 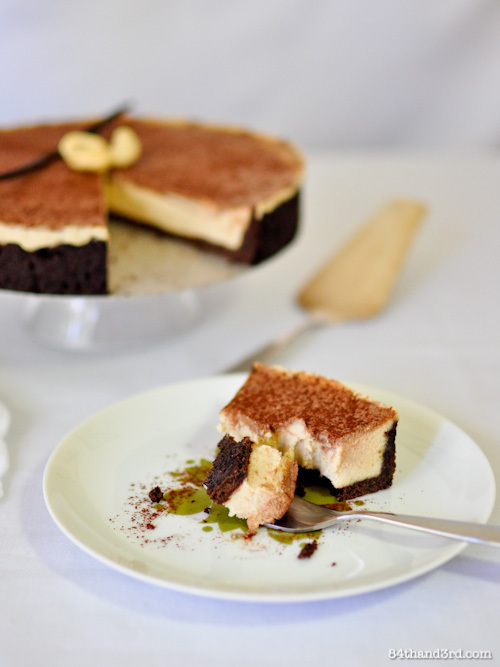 I remember seeing the cashew cheesecake on My New Roots and thought it looked and sounded amazing, I love your take on it, especially the chocolate quinoa crust which sounds delicious. I don’t do normal well either. My husband doesn’t do dairy so we’d both love this cake! Welcome to the club, grab a t-shirt on the way out 😉 I hope you try the cake! This looks delicious and I am so intrigued by the quinoa crust!! JJ this is just crazy town! I was so curious after you described it to me the other night but it looks delicious and definitely something I would try. Kudos to you Miss Creative! This looks fantastic! I’m surprised the dates don’t make the filling look darker. Looks like it should be in a cafe window…and you’d never guess it was a ‘free from’ recipe. Is it gluten free too or is there gluten in the crust? Cheers. It surprised me too, I thought it was going to be much darker but they ground up so fine it came out quite vanilla. No gluten in the cake or crust – I’ll post in very shortly! This is a wonderful creation, JJ. Your recipes always inspire me to try something different. I am intrigued by cashew cream, I have heard about it a lot lately and am definitely going to give this a shot. Thank you for sharing. If this tastes as good as it looks then you are onto a winner. I never would have guessed it was free of so many nasties! I really must start experimenting with things other than butter and sugar. This looks awesome JJ. I’ve been reading a lot about coconut oil lately and want to try something with it very soon. Lovely cake! I love the sound of the crust! Can’t wait for that recipe. Honestly, these pictures are so beautiful. 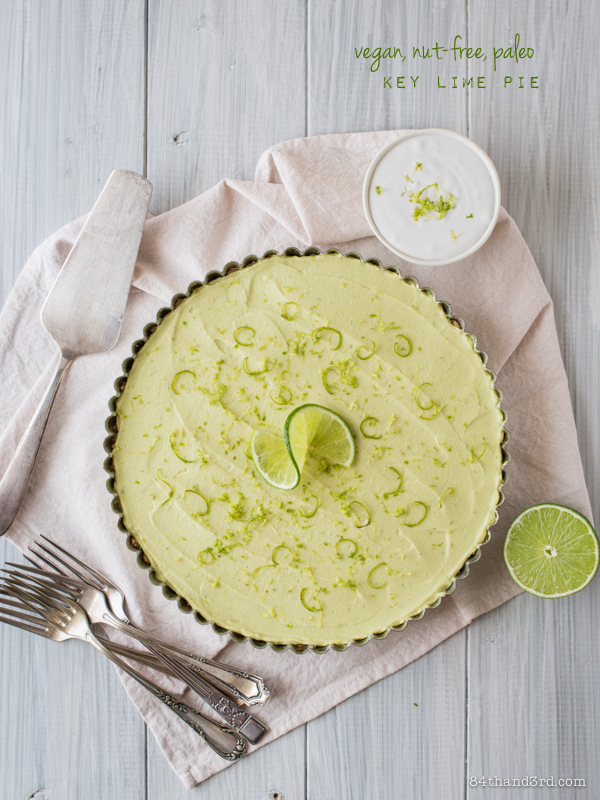 You’d never know that this wasn’t a typical cheesecake. As usual you have sparked my curiousity with another recipe! Cashews in cheesecake??? Bookmarked my dear! 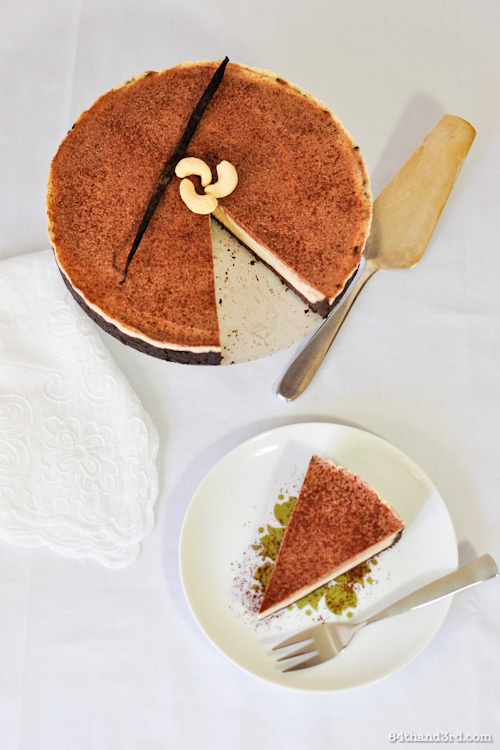 Your cheesecake looks absolutely delicious and very tempting… love dates and cashews! Wow, I’m intrigued. Might have to try this one day for my lactose-free mother…! Oh wow. This looks absolutly amazing. 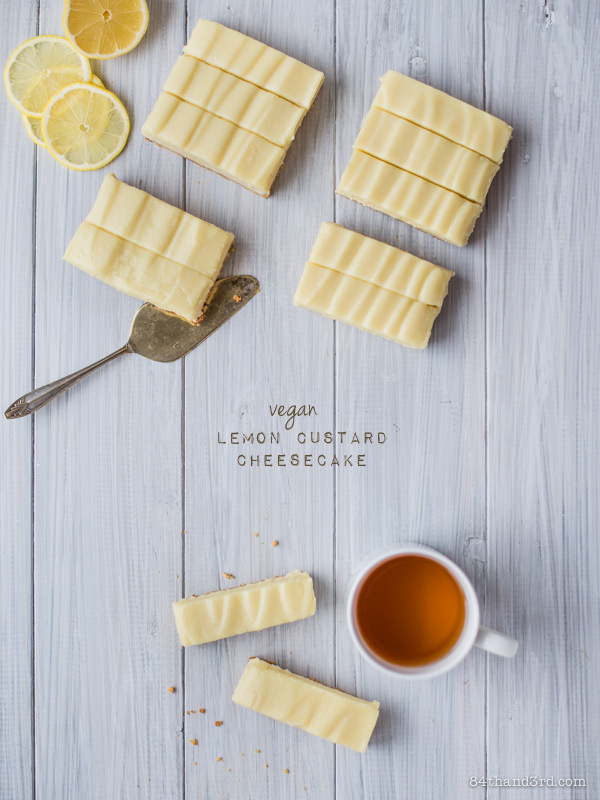 I have quite a few friends whose kids are allergic to dairy so this looks like a perfect treat to be able to make for them. Looks absolutely perfect to adapt for Thermie too 🙂 Thankyou so much for a fantastic recipe! This looks so amazingly delicious!!! It cannot be done without the coconut oil right???? Thanks Maggie! I guess you could do it with butter if you wish (since that will also firm up when refrigerated or frozen as well) but I’ve never tried it – let me know if you do! I just wanted to say thank you for thinking of me and we can not wait to see you in September and even more so if there is the possibility of dessert! This looks amazing! Wow, will you make one for me, too? Hi, there, looking at this recipe, I wonder if date sugar could be subbed for the soaked dates. I have a great health food store nearby that sells all kinds of sweeteners, date sugar included. Thoughts? Hi, I just made your cheese cake, and it was fabulous. As my daughter said,” bang tang alagang. Just perfect. Thank you so much for this make it over and over again cheese cake.